Maine Republican Party Chair Rick Bennett at a news conference in early September. AUGUSTA, Maine - Republican Party Chairman Rick Bennett, in an email to MPBN News, says the headline on a party news release attacking Democratic gubernatorial candidate Mike Michaud for a lewd video last week was "regrettable and inappropriate." Bennett has also called Michaud to apologize. 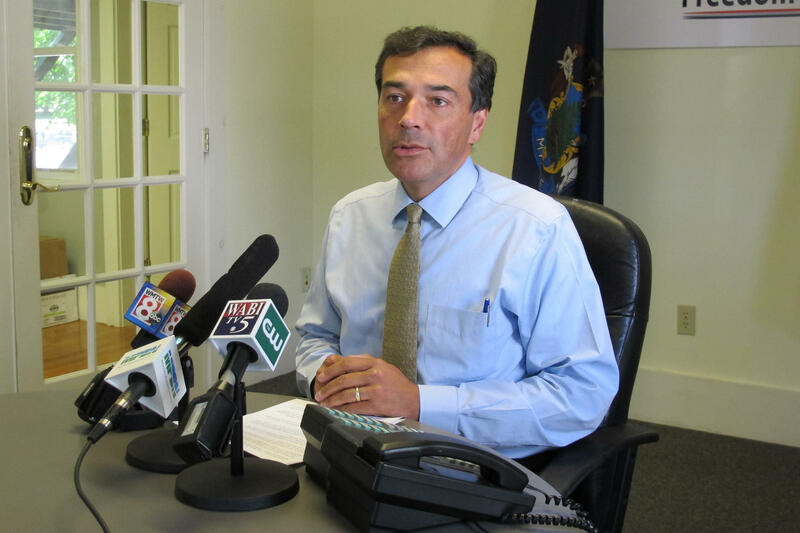 Mal Leary reports on the Maine GOP's apology to Democratic gubernatorial candidate Mike Michaud. The news release sparked a firestorm of controversy that continued into the weekend. The headline said: "Michaud Suggests Sen. Collins Performs Graphic Sexual Acts; Maine GOP Condemns." The release inaccurately blamed the Michaud campaign for a video produced by an independent blogger and containing a rap music soundtrack that referenced a lewd act. And Michaud was angered by the press release and the suggestion that he would deliberately offend Republican Sen. Susan Collins. "It’s wrong. The whole press release is wrong," Michaud said, in a telephone interview. "And for them to try and associate me with that video is wrong. It’s an outright lie." In his email, Bennett tells MPBN the release went out before it had been reviewed. He says the flaw in the GOP’s process for issuing news releases has since been corrected. A call seeking further clarity on that point was not returned by airtime. But Michaud says Bennett did leave him a voicemail message offering an apology. "He did say that the headline was terribly inappropriate and it was definitely overstated, and he has been assured it will not happen again," Michaud said. "He is going to put proper procedures in place to make sure that it doesn’t happen. And he was sorry for the personal concern it has caused me." Michaud had asked Bennett to investigate how such an inaccurate statement could be issued and was told by the GOP chair that he would look into the matter. Michaud says he is grateful for Bennett's response and will be contacting him to say so. PORTLAND, Maine - Just when you thought the race for governor might return its focus back to the issues, a flap being spread on social media has exploded onto center stage - at least for today. The ingredients include a video with some off-color rap lyrics, the Michaud for Governor Campaign and the Maine Republican Party, all mixed and churned by Twitter. Tom Porter: "A.J. Higgins, MPBN's state house bureau chief, is with us this afternoon to help us sort it all out. Good afternoon, A.J." A.J. Higgins: "Hi Tom, always a pleasure."